There are various koshi-koden, secret documents from ancient Japan. They have been kept secret both by hostile repression and for safekeeping of wisdom. The Takenouchi records were compiled over a vast period of time; they were preserved by the Takenouchi family until these modern times. The Hotsuma Tsutae is a later record of a time of legendary figures which gives an insight to changes in human society. According to the Takenouchi Monjo, people lived spiritually in peace and plenty for a long period of time. However, new generations grew restive; they wanted more materiality and physicality. The guiding elders discussed this seriously and eventually made the decision to let humanity undergo a period of exploration of the material world. The sages would cooperate so that this painful period would be as brief as possible. Thus the First Civilization gradually ended and the Second began. The decision for the transition was made about ten thousand years ago. Wisdom keepers began to hide their teachings by concealing documents, by creating and spreading myths that veiled the true nature of the stories, and by building religions that would impart some and only some of the truth. Although veiled, precious wisdom would need to be accessible when the time came for it to be revealed and applied. When we think of how much humans have accomplished even in the last two thousand years in analyzing and controlling the physical world through technology development, building of nations, formalizing religions and other social systems, we are not amazed to realize that this material civilization has just about culminated. The Second Civilization is nearing its end. In the Takenouchi Documents, transition dates of 2011 and 2017 are given. The Third Civilization of higher consciousness and greater unity is coming. This is the age all ancient wisdom cultures have been awaiting. Those who are on the Path of Wisdom see signs of returning spring. As the physical world of nature and man grows more disruptive, at the same time more people are awakening to walk the Path. The world is emerging from the bleakness of winter into the rebirth of spring. The Path of the ancient ones of the Japanese Islands is called Kototama. This term refers to the spiritual (tama) power of sound (koto). Its formal name is Kototama Futomani, Kototama Great (futo) Mana (energy). Kototama Futomani is a cosmology and a practice. It is based on the fundamental property of Universe to create, to manifest, by vibrations. Vibrations produced by the human voice form the sounds of speech. We often forget that these vibrations of speech carry great spiritual energy. Kototama is based on the principle that the way sound patterns are organized determines the development of individual human consciousness and of human society. Civilizations evolve and fall on the basis of these sound systems. Most important of the sounds are the vowels, aptly called mother sounds. In Kototama, we teach the sounds rather than the letter names. The sequence of the vowels plays a key role and describes the process of human and societal development. Consonants are father sounds and together they create child sounds. Kototama science is deep and complex. We can only give the tip of the iceberg. The power of the vowels can be briefly and inadequately presented in the following. Do not be misled by words. It takes practice to understand the subtle workings of these vowels. Individual sounds cannot be understood in isolation, for they always interact with other sounds. By working with these hints, we can begin to get an idea of the three civilizations. Hotsuma Tsutae is another Koshi-koden. It is a legacy written in a beautiful script called Woshite. It was recorded two to three thousand years ago. It relates history and teachings of advanced humans thousands of years prior. We can well wonder how to fit the Hotsuma Tsutae into the overall scheme of the Takenouchi. The main characters of the Hotsuma legends are known to readers of the conventionally accepted books: Kojiki (711 CE) and Nihon Shoki (720 CE). By the eighth century when these two documents were produced by royal order, there was already a formal ruling system and a stratified society. Elements considered not suitable for the court’s political purposes were eliminated or modified. It is very illuminating to compare the contents of the two koshi-koden documents with the eighth century versions. Today’s scholars recognize a long period of peace and culture called the Jōmon period. The name Jōmon was given to describe the cord-marked earthenware said to be the oldest in the world. The Jōmon period lasted from about 14,000 BCE to 300 BCE, a remarkably long period of peace. It was followed by the Yayoi (300 BCE to 300 CE) with significant immigration from the Asian continent which greatly impacted society in the islands. Then came the Kofun period of burial mounds, and so on into historical times. In terms of Kototama sound order, the Jōmon would be Sugaso and the following periods Kanagi. Where does the Hotsuma culture belong in this timeline? There are two seeming inconsistencies when dating it. From the spiritually guided nature of Hotsuma society, it would appear to belong to the Sugaso order, at least in the beginning. The early tales are full of compassion and resolution of conflicts by nonviolent means such as negotiation and Kototama. Society was guided to embody Heaven on Earth which means to live in harmony with nature and universe. In the teaching sections of the Hotsuma Tsutae, the lessons emphasized living the Way of Hotsuma which is the Way of Heaven. We know the sound order of their language through a teaching song, Awa no uta, the song (uta) of Heaven and Earth (A and Wa). It goes like this. From this we see that the vowel order is Ah Ih Uh Eh Oh, the Kanagi order of the Second Civilization! So we may view the Hotsuma culture as the last gasp of the Sugaso. As in the above Awa no uta, the entire Hotsuma document is written in verse of 5 and 7 syllables. When a master poet is asked why, she replies because 7 and 5 are the rhythms of Heaven and Earth. Deep study of the Woshite syllabary has led to some understanding of the cosmology of the Hotsuma people. As later tales unfold, especially the last 12 chapters which were added generations later, we view society moving more and more to materialistic worldviews and behavior, thus fully entering the Kanagi civilization. The sacred is declining and materialty is growing. There are battles of nation-building. While the building of a nation may seem grand and glorious, it comes at the cost of human blood and suffering. These stories mark the beginning of our Second Civilization. Hotsuma tales record the transition from the First to the Second Civilization. Since Hotsuma times, we have continued down this path of separation and conflict, loss of connection with other people and our environment. We can go no further. We must stop and build the Third Civilization. The documents mentioned here all include the common story of Ama no Iwato no Hiraki, the opening of the heavenly cave door. All four prophesize that the door of darkness will be opened and light of truth will pour forth once more. This entry was posted in Ancient civilization, Cosmology, Hotsuma Tsutae, Kototama, Takenouchi and tagged Hotsuma Tsutae, Kototama, Takenouchi on 2015/05/10 by Okunomichi. Let us introduce some of the leading Kototama researcher-practitioners of the 19th and 20th centuries. The story begins with young Emperor Meiji who, soon after his marriage began the study of Kototama using two secret documents. Recall that the Kojiki is one of the two most important documents of Japan. It begins with fantastic tales of the Age of Gods. These myths were considered to hold secret meanings. Later, we will present teachings from Yamakoshi, Ogasawara, and Nakazono, as well as Shimada Masamichi. 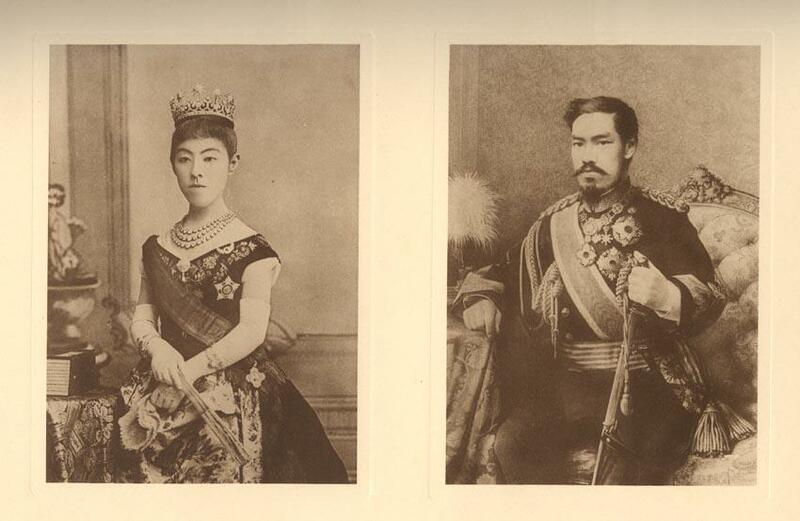 Emperor Meiji is best known for the Meiji Restoration of 1876 when he became Emperor at a young age. After his marriage to the Empress, he began to reconstruct the Kototama meaning hidden in the Kojiki together with her, and with Yamakoshi Senior and Junior, and Ogasawara Koji. The Empress was born in Kyoto in a prestigious Fujiwara family. 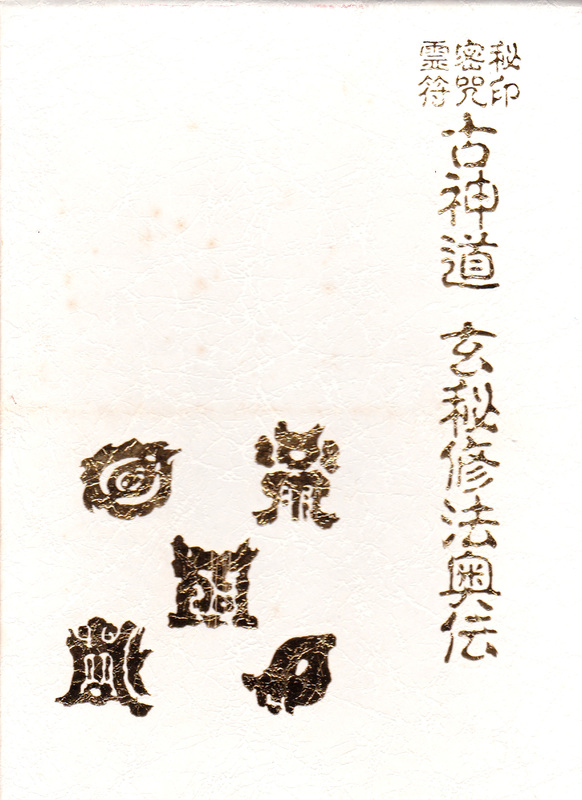 Upon marriage to Meiji, she brought a key to decrypt the original meaning of the Kojiki. It was half a document, and it matched the other half kept by the Imperial family. Published Passage to the Third Civilization in 1964, Kototama Hyakushin in 1969. Nakazono studied with Ogasawara prior to 1969. He had studied kototama as an aikido student of Ueshiba Morihei, founder of aikido. He published several books in English, including Inochi and The Source of the Present Civilization. This entry was posted in Kototama and tagged Meiji on 2014/09/04 by Okunomichi. MIKUSA NO KANTAKARA, three sacred treasures. This is a kototama-in (word-mudra) practice in which mysterious power of universe comes to you. The three treasures are kagami, tama, and tsurugi. These are three sacred practices. Kagami = mirror representing the body of sun; Tama = jewel representing spirit of moon, symbol of kami; Tsurugi = sword representing energy of stars. Note that each treasure has two parts. Mudra #1 is the same for all three mikusa, but the kototama chants differ. See the book for kototama and mudras. Kagami practice #1 – show your real self, cleanse it. #2 – remove dirt from bad things around you. Tama practice #1 – cleanse your tama, your soul-jewel. #2 – bring ame-tsuchi (heaven-earth) inside & outside. Tsurugi practice. Note: Here, tsurugi is the Murakumo no tsurugi, the sword that Susanoo took out of Yamata no Orochi’s tail. The eight-headed Orochi here represents troubles, desires,etc. Cut them with tsurugi, the double-edged sword. When you cut enemy, you can also cut yourself if you have bad thoughts, so be careful when you use it; be clear-minded. #1 – polish the sword. #2 – deal with the enemy. Oharai is most important to do at beginning of practice: purify the place, person, and osonae offering. Wave the nusa paper wand, or its equivalent practice. Shime-no-in, as in the straw rope called shimenawa, sets the boundary of the pure space. We do the oharai and the shime-no in before embarking on the mikusa practice. MISOGI AS OHARAI. Misogi has outer and inner aspects, i.e., omote and ura. The outer is the standing under the waterfall. The inner can be explained by the word misogi which is mimi-soso-gi. Mimi is ear, and misogi is the listening to all the sounds of the universe, cleansing the spirit, and bringing kajiri to your ear, where kajiri is a promise made to kami. In mudras, the fingers making promises (kajiri) with kami. Fingers are called yubi (yu is hot water, and hi is fire in kototama). This teaching is from the Genpi book of Omiya Shirou shown above. This entry was posted in Kototama and tagged Omiya Shirou, practices on 2013/10/06 by Okunomichi. Kototama refers to the rhythms that bring forth the manifested world. Mother rhythms are the five vowels あ い う え お which span the dimensions of infinite space. They are the processes of movement of: space, wind, fire, water, and earth. Moving space gives rise to moving wind, which gives rise to moving fire, and which in turn gives rise to the flowing down of moving water/liquid and earth/solid. Father rhythms are the eight consonants which develop time. These are the processes of creating life and building the world. Please refer to the Hotsuma woshite table. This becomes a Chart of Generating Space and Time. 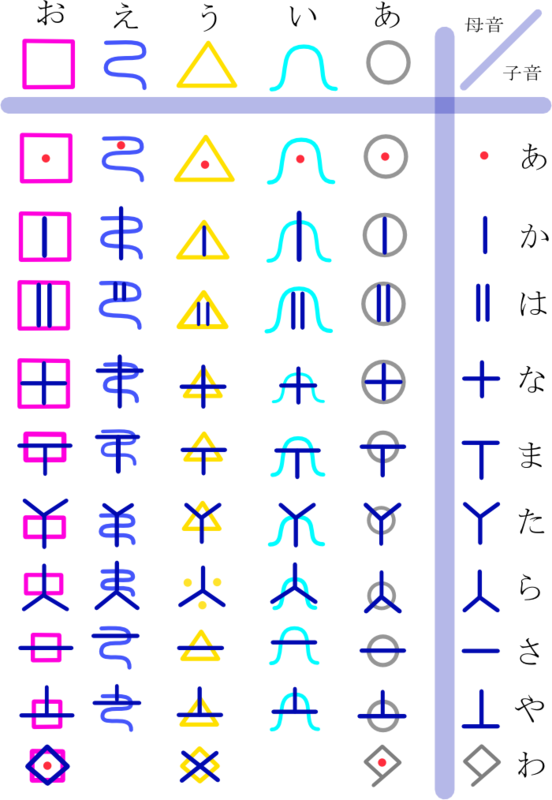 Top row symbols are the mother symbols which span space. Right column symbols are the father symbols of time. The elements in the matrix, combinations of father-mother rhythms are the processes of generating space and time. Observe that the Hotsuma character for utsuho is a circle. It represents ku (sora), the sacred place that creates everything in the universe. It marks places of power such as pyramids, stone circles, and kofun burial mounds. Note: utsubo is a sacred vessel and also refers to a mother’s womb. We also know of the Tsubo no Ishibumi, a stone monument, which the poet Matsuo Basho sought at Tagajo. This entry was posted in Hotsuma, Kototama and tagged Kototama, Rei Torii on 2013/09/12 by Okunomichi. (L) Kada’s Inari Koden Chart. (R) Yamaguchi’s Futomani no Mitama Chart. Editor’s Note: This is an English rendering from the Japanese book, Koshinto Gyoho Nyumon by Omiya Shirou, pp 100-107. Yamaguchi Shido in the mid-19th century wrote a book that integrated the strange symbols found in two ancient scrolls into a metaphysical system of Kototama. In 1765 Yamaguchi Shido, the son of a wealthy farmer, was born in Awanokuni which is the modern-day Kamogawa-shi in Chiba prefecture. He was a child prodigy and learned Chinese literature at a young age. When he was 25 or 26, he moved to Edo to live with his uncle. He started the study of kokugaku, which is the study of ancient Japanese literature. The Yamaguchi family had handed down over the generations an ancient scroll that contained a mysterious chart known as Futomani no Mitama, also called Kagotama. Yamaguchi wanted to unwrap the secret of this chart. After three decades of studying, he came to understand that Futomani no Mitama told the secret about ancient kototama, the power of sound. But he did not quite understand the kototama. The Inari Koden or Mizuhi no Ontsutae chart was handed down in the prominent Kada family. 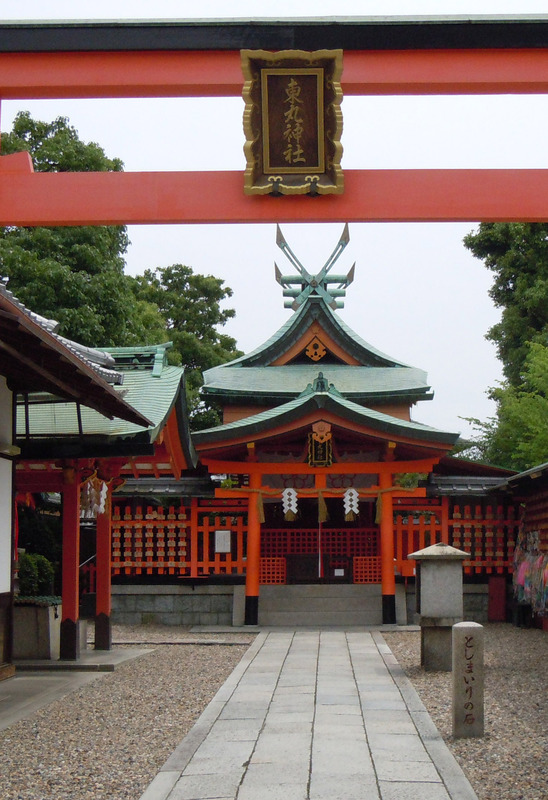 The Kada family, together with the Hata, of Kyoto were hereditary priests of the Inari shrine in Yamashiro no kuni, the present Fushimi Inari Taisha shrine in Kyoto. The noted kokugaku scholar, Kada no Azumaro (1669-1736) possessed this chart at one time. Azumaro has a lovely shrine at Fushimi Inari which I visited in 2012. Azumaro passed the chart to his adopted child, Tamiko, who in turn passed it to Kada no Noriyuki. Yamaguchi Shido studied classical Japanese literature under Kada no Noriyuki. Later he taught nobles at the Imperial Court in Kyoto. During these studies, Yamaguchi was given the Inari Koden chart. [Inari Koden probably means the ancient document of Inari.] The secret symbols written in the chart enabled him to solve his question of the ages about the Futomani no Mitama chart. By receiving the Inari Koden, Shido became more confident about his study. In the year Bunsei 1, 1818, he returned to Edo and spent five years in developing a solid base for his study. In the year Tempo 1, 1841, he was invited to the house of Fukui Shigetsugu, his brother-in-law, at Kameyama in Kyoto. There he began writing his work entitled Mizuho no Tsutae which became his life-time achievement. After that, his study of Kototama became so popular among court nobles in Kyoto that he gave many lectures to them. In the year Tempo five he finished writing seven volumes of Mizuho no Tsutae. Two years later, he was invited to see Kishu Tokugawa (one of the top three Tokugawa-related families) and went to Kishu in Wakayama. There he offered his books, Kamikazeiki and his series of Mizuho no Tsutae to Kishu Tokugawa. According to Yamaguchi, all things in the universe consist of water and fire. These are also referred to as the sound of “i” and the sound of “ki.” Earth and people are all made up of these water and fire elements. The universe can be very much affected by the kototama that is created from water and fire. Shido thought “iki,” breathing, also consisted of water “i” and fire “ki.” Breathing was absolutely imperative to carry the words with kototama in them. For him, iki means to live, ikiru. Yamaguchi found that the Inari Koden had much to do with Futomani no Mitama. He carefully compared them to each other. He revealed that the creation written in Kojiki actually told about the generation of goju-on, the fifty Japanese kana characters/syllables. 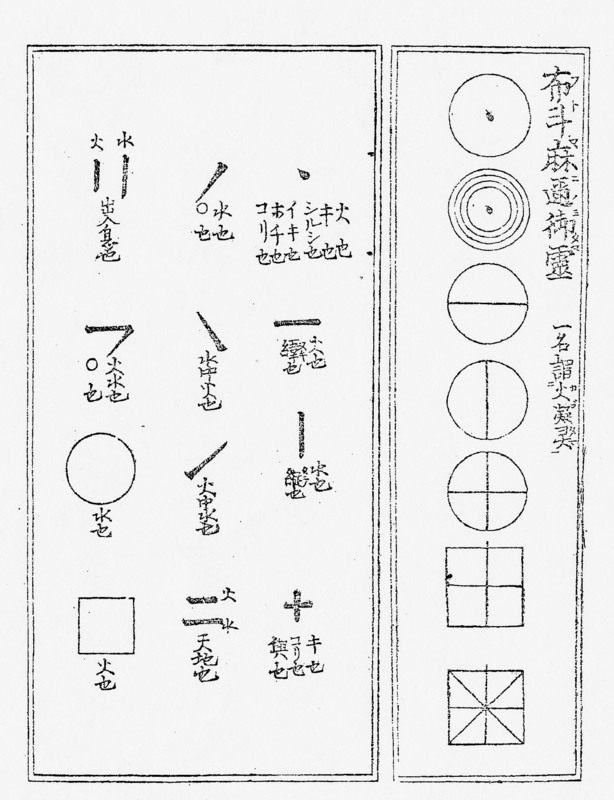 Yamaguchi saw that the Futomani no Mitama was made upof the five elements: the dot, the circle, the horizontal line, the vertical line, and the square. He realized that the Inari Koden, through its twelve forms explained each of the five symbols in the Futomani no Mitama chart. This helped him work out the hidden meaning of Futomani no Mitama. Yamaguchi noted the goju-on, the fifty voices of the kana syllables, as principal sounds and he made them into figures that represented the true identity of the universe. The Japanese 50-kana syllables are a system showing the power of sound that controls the universe. You can control the universe if you have a deep understanding of each sound. The belief of kototama that koto, something that is said, will become koto, something that happens, is a metaphysical system in the innermost recesses of traditional beliefs. This entry was posted in Koshinto, Kototama and tagged Futomani no Mitama, Inari Koden, Kada no Azumaro, Kagotama, Kototama, Mizuho no Tsutae, Omiya Shirou, Yamaguchi Shido on 2013/07/29 by Okunomichi.